Moving Mom: Part 2 ~ What to do with all her stuff! My mother-in-law, Fran, sold her house in record time: 3 days. Fortunately, the closing was scheduled 6 weeks later, so she had plenty of time to get use to the idea and start packing up her household. That is no easy task! Just think of how much stuff you have today and multiply that by 20, 30 40 more years! There is a simple formula for down sizing or organizing. 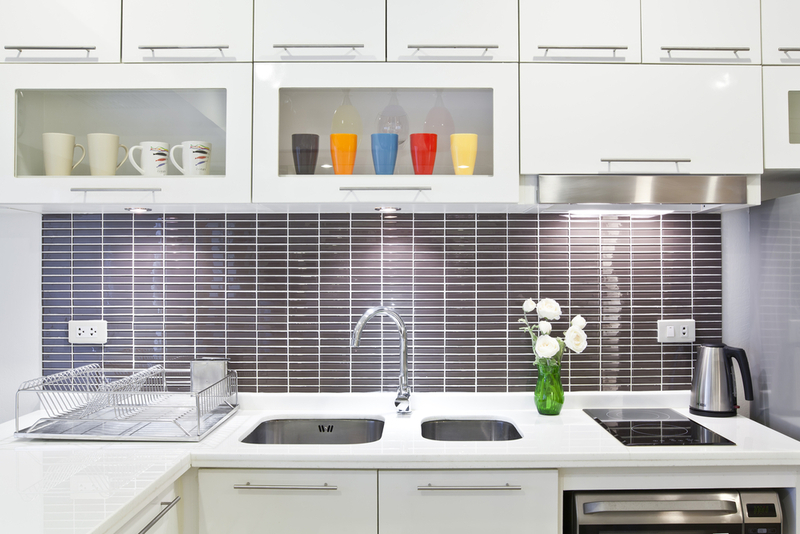 You don’t have to be moving to implement the organizational tips. First she decided what she definitely wanted to keep and take with her. 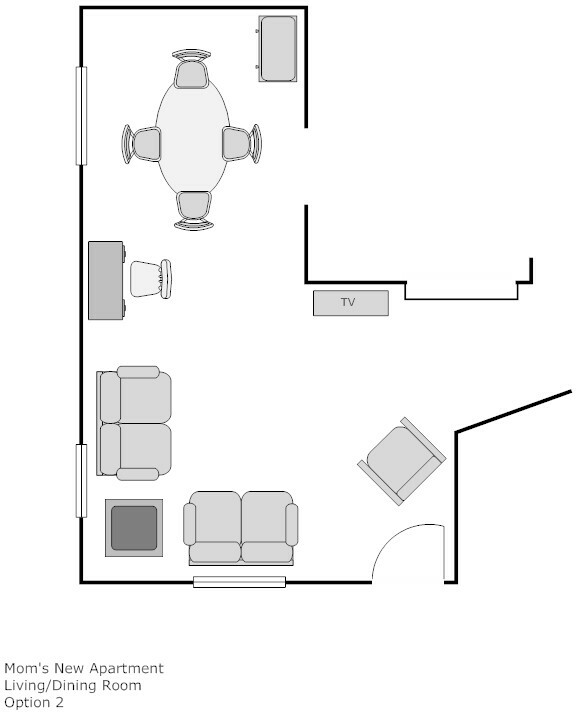 I drew up a floor plan to make sure the furniture would fit. What do you do with the rest? She gave her daughter Jackie and I first picking on everything she did not want. 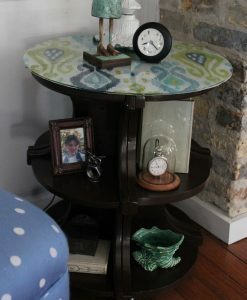 After we took some furniture, dishes and mementos, the grand-kids could take whatever they wanted. I know Fran felt better knowing some of her things were going to good homes and would continue to be useful. She was able to take her two love seats, two chairs, dining table and chairs, sideboard, highboy desk and various tables. 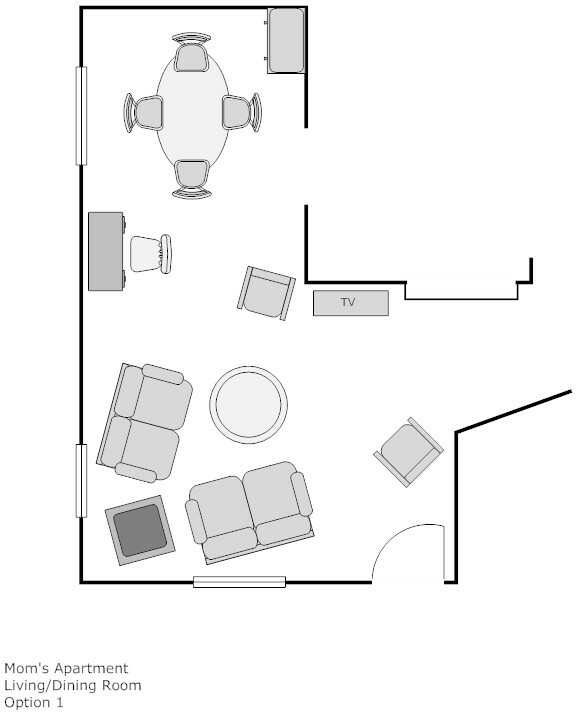 The first plan shows her sofas arranged in the corner with a table between them. This would have been the perfect solution except the wall air conditioner is below one of the windows and we didn’t want to block it. Most of the furniture is lined up along the the walls. Not always ideal, but it's often the only option in small spaces. The next plan is basically the same with the love seats placed on an angle. I added her round coffee table and the second chair next to the TV. She has seating for 11. She can create additional conversational areas by moving the dining chairs around. The porch door doesn’t need to be open, so a chair can be placed in that corner too. She will probably put her Christmas tree in that spot. The sofas are angled to allow for the air conditioner. By pulling the furniture away from the walls, the arrangement is more welcoming and interesting. All her bedroom furniture fit and she is using the second bedroom for her sewing machine, second TV and extra arm chairs. She is very happy in her new home. Next month I will show you how we added color and personality. No one wants to live in a sterile, white apartment!